A fisheries biologist has suggested that lake trout may have migrated to Yellowstone Lake on their own. There is a long established population of the fish in Jackson Lake, and those fish occasionally pass through the dam into the Snake River below. Yellowstone National Park chief fisheries biologist, Todd Koel, said that from the Snake, the lake trout could have entered Pacific Creek. After a 40-mile swim upstream, the fish would have reached North Two Ocean Creek. That's where the creek parts, forming Pacific and Atlantic creeks. Atlantic Creek flows into Yellowstone Lake. That's 80 miles, lake to lake. 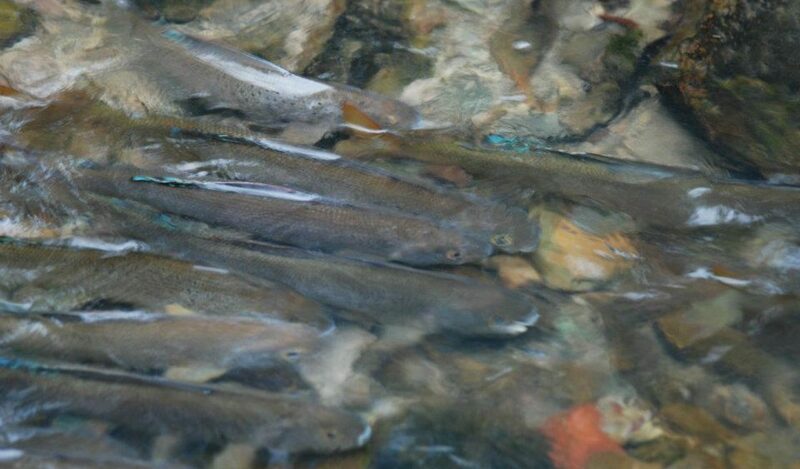 It's a long journey for lake trout, especially in small, high-elevation streams. But work in the Flathead system has shown lake trout are capable of long migrations. Some have travelled from Flathead Lake up the North Fork all the way to Canada. Others broke off the full migration to the land of politeness and hockey, following smaller streams flowing from Glacier National Park. This allowed the invading lake trout to displace the native, but less adaptable apex piscine predator, bull trout. Research on the Flathead, Glacier lake trout invasion gives credence to the theory. Because of the work on the Flathead, we know lake trout are capable of making such long, exploratory forays into new habitat. We also know they are capable of making significant journeys up smaller, headwater type streams such as the ones that connect Glacier's lakes with the North Fork. What's different about the migration theory for Yellowstone Lake's invasion is that most of the 80-mile journey is in the smaller waters of Pacific and Atlantic creeks. In the Flathead the bulk of the migration is in the larger North Fork, a waterway that is likely more appealing to lake dwelling lake trout. Still, there's an unimpeded waterway from the Snake to the Yellowstone. In fact, it's the path the cutthroat trout likely followed during their ice age invasion from the Pacific watershed to the Atlantic. The prevailing theory is lake trout were introduced to Yellowstone Lake by bucket biologists, ie. anglers who caught lake trout in nearby Lewis Lake, then dumped them into Yellowstone Lake. Lewis Lake is also the source of the lake trout population in Jackson Lake.